Let us give YOU back time do to the things that matter most. We tailor your cleaning process to your needs and budget. Gift Certificate's are Here ! Our 100% make you do a happy dance guarantee! If you’re not doing a happy dance, we’ll come back within 48 hours to make things right and dance along with you! A clean home is a healthy home. In less time and without the headaches, you can have an experienced cleaning team regularly clean your home. You want a home that ensures your family health is not impacted by hidden dust, mold or germs. Making this happen requires consistency, the right tools and products, the time, energy and a plan to make sure all the visible and hidden parts of your house are clean. An understandably difficult job. We see to it that your bathrooms will sparkle as new. We wipe, clean and scrub floors, counters, sinks, shower walls, toilets, and baseboards. We also wipe mirrors, light fixtures, heating ducts, window sills, light switches, outlet covers and others. We even remove garbage, hair and other residues present in all corners of your bathroom. The kitchen is where you prepare, cook or even keep food. This is why kitchens must be cleaned thoroughly at all times. We at Two Ladies & a Bucket can deeply clean your kitchen. We clean counters, kitchen appliances, dishwashers, cabinets, ceiling fans, windows, window sills, stoves and others. We also scrub sinks, remove garbage and other things you want to be removed or cleaned. Aside from being clean, all dining rooms must look presentable. We clean, sweep, vacuum and mop floors. We also clean and wipe window sills, sliding glass doors, boosters, highchairs, barstools, chairs, tables, baseboards, outlet covers and light switches. We make your dining room as presentable as possible. Two Ladies & A Bucket home cleaning services is based out of St. Louis Missouri. Our continued success is because of our loyal customers who enjoy our attention to detail, and courteous service, and refer us to their friends and neighbors. New customers will be hooked once they experience our staff’s professional attitude and they're spotless home! We are a fully bonded and insured cleaning company, serving the St. Louis Metro area, including the counties of St. Charles and Jefferson County. Call or contact us if you have any questions about our service area. We will provide you with the details of the services we provide or schedule a complimentary evaluation of your home and it’s unique requirements. Have questions or just want to get started today? Know someone who wants to hang with family and friends instead of cleaning??? Then have them give us a call so that we can amaze them like we amazed you. 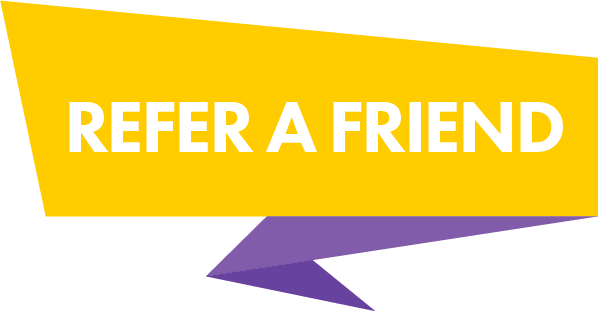 Refer a friend and you both get a gift!